As it is Grandparents’ Day today, my thoughts turn to my own grandparents. I never knew my maternal grandmother as she died when my mother was only 18 years old. But I do remember my maternal grandfather, Timothy, as he lived with us when I was just a wee girl. I remember clasping his hand and tottering alongside him (he was a tall, stately man), as we walked across the street to the shop on the corner where he bought me a wee packet of sweeties (what we call candy in Scotland), and then on to the park where he would watch me toddle on to the roundabout. My paternal grandparents lived a little longer and I do remember spending time on the farm in Ireland with them. I remember my grandmother, Martha, as a quiet and gentle woman who let me help her feed the chickens and who would lead me up to bed at night in the farmhouse with the light from her oil lamp. 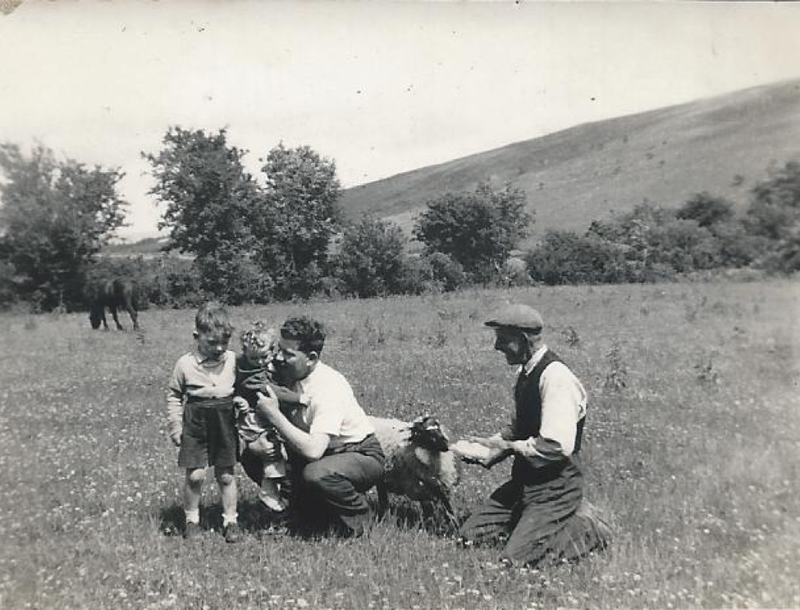 My grandfather, Joe, seemed much sterner, but still I enjoyed the hay rides he would give us on the tractor, and watching the sheep being sheared and the biggest treat of all – feeding a bottle of milk to the baby lambs. My grandparents had more than 20 grandchildren, and so I don’t ever recall having much special one on one time with any of them, but as I look back on these childhood memories of them, I think the greatest gift they gave me was – a love of nature, a love of time to be, and of course – my parents. Thanks Kate and Tim, Martha and Joe! Me – around age of 4 – sitting on doorstep of my grandparents’ farm in Ireland. My grandfather on the right, my dad and two big brothers – I had not yet arrived on the scene! What we teach a child to love is more important than what we teach a child to learn.